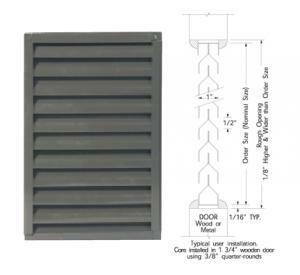 Advantage Louver Model 40Y Free Flo Louver is a 1" deep louver for a wall or door of any thickness. The 4Y steel louver is made of Cold Rolled Galvannealled Steel and has inverted "Y" blades with 20 gauge "U" frame surrounding. Transom in any wall or door. User to supply molding. - Construction: Cold Rolled Galvannealed Steel. Frame 20 Gauge. Blades 24 Gauge. - Blade Design: Invert "Y"
- Rough opening is 1/8" wider and higher than order size. For More Information: Sales/Tech: 866-257-7449 Ext 701 Fax: 866-856-4445 Bestlouver.com LLC Naples, Florida 34114 Email: mjhbestlouver@aol.com Click the blue product specification link above to download specifications.